Squire Cottage is an old farmhouse built half in stone and half in timber and render with a smattering of red brick! It sits at the top of a field looking down towards the River Redlake and the Dingle with its babbling brook and ancient wet woodland. With superfast wi-fi broadband and a smart phone with wi-fi calling, you need not be completely out of touch unless you want to be - your choice! The cottage sleeps four people comfortably in two bedrooms; a cot and an airbed are also available for extra family members. The front door opens onto one open space with a large inglenook fireplace complete with bread oven, dominating the ‘living’ end of the room. Here you can sit around the open fire telling stories, reading, listening to music or watching television. 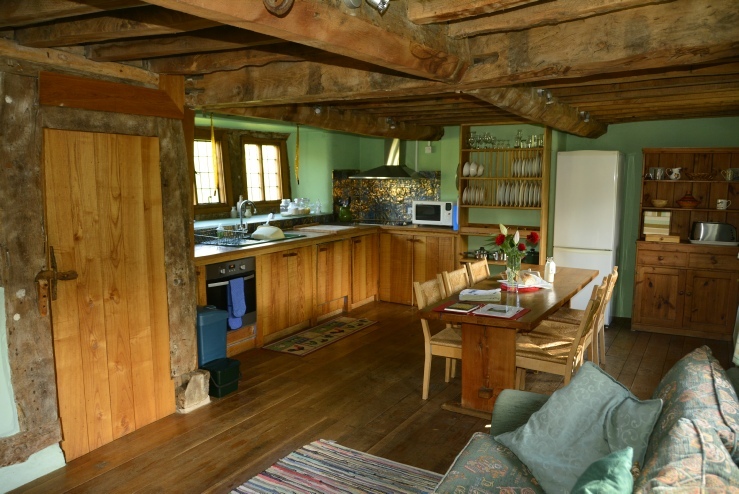 At the other end, there is a fully equipped kitchen with hand built oak units and a large refectory table. There is also a small cloakroom with lavatory and washbasin and room for wellies and boots. 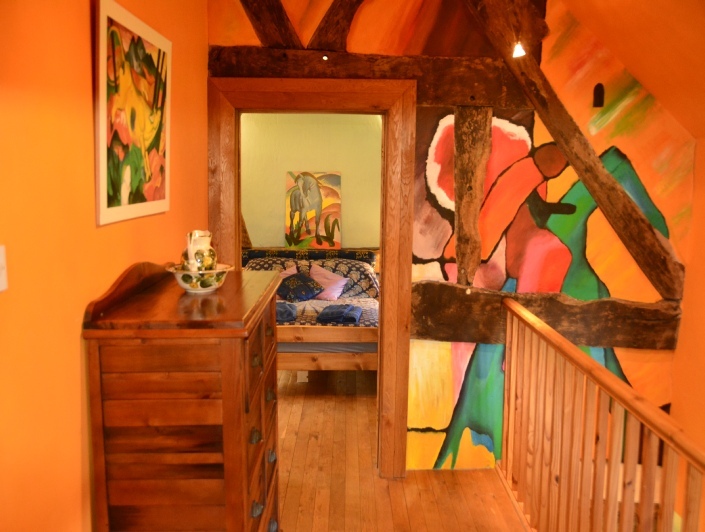 Wooden stairs (mind your head and don’t be distracted by the view through the window) lead up to a spacious landing and to one room with two single beds, the bathroom and the double bedroom with a magnificent chimneybreast. The cottage keeps it’s ancient authenticity and rural feel by retaining the old beams complete with redundant peg holes through which the children can spy on their parents! New oak flooring with rugs and mats add to the cosy and comfortable feel of the place; though watch your heads, some of the doorways are very low. 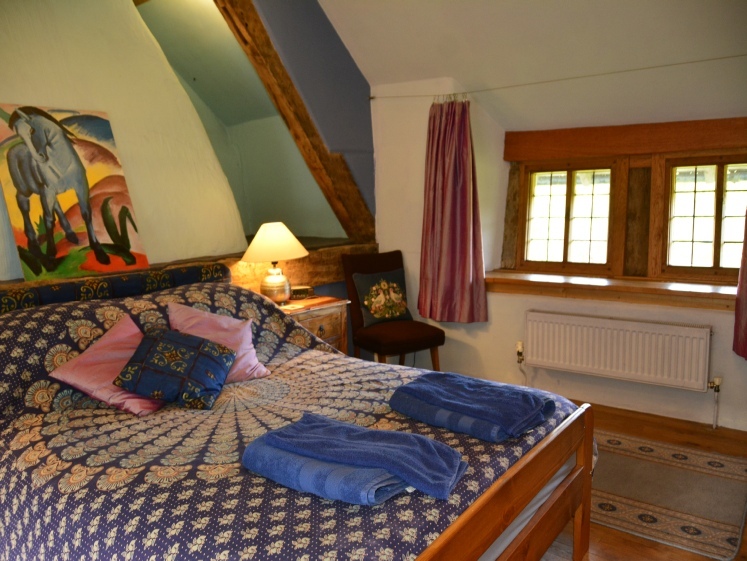 There is central heating and hot water provided by an oil-fired boiler, but please don’t expect hotel-type temperatures in Squire Cottage, it is an old building with all the characteristics of such a building! 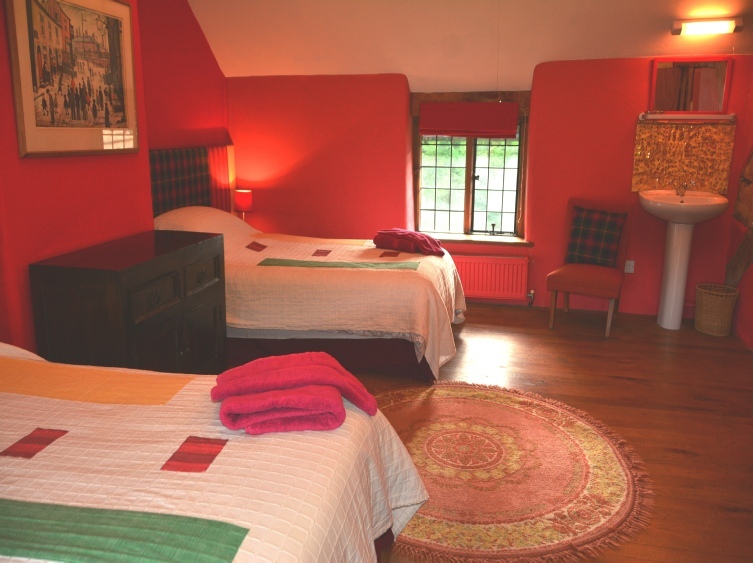 Bed linen and towels are included in the price as are logs for the fire and all the electricity. As there is no mobile signal here, there is a telephone in the farmhouse should you really need to use one. A cot is available and children and pets are welcome. For full details of cottages including access click here. This was a beautiful cottage, full of old world charm yet with all modern comforts. Generous welcome pack, comfortable & clean. Quiet which is very important to me. A good location for exploring the lovely villages & attractions & not too far from lovely Ludlow. It's always nice to unravel the mysteries surrounding old buildings, it's even better to have the privilege of living in one and to have the opportunity to experience the slice of history which is Squire cottage, even if it's only for a short while. Squire Cottage is the perfect place to curl up in front of a roaring log fire with a book after a brisk walk to the top of Caer Caradoc to watch the sun come up. There is a discount for couples using just one room. What a way to celebrate 19th wedding anniversary. Cottage was brilliant. Sheep and horses in your garden, stunning views. Owners were very helpful when our car broke down. The welcome pack was a nice surprise. Lots to see in surrounding area. We will be back as soon as we can. Thank you for a lovely stay.